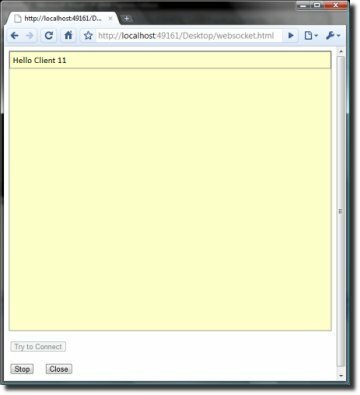 HTML based client application (uses WebSocket to fetch EventLog entries). 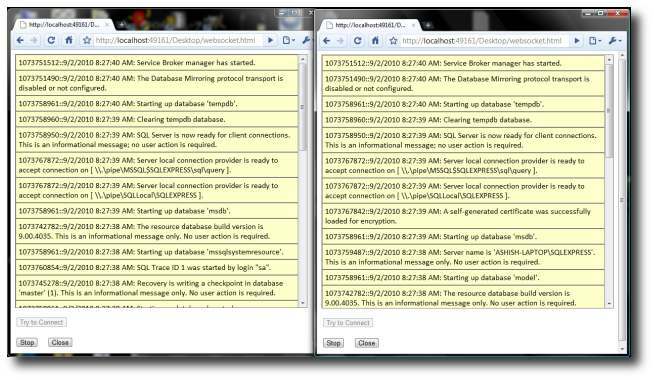 This article is about creating a simple web based event log monitoring application that uses "server push" to update data. 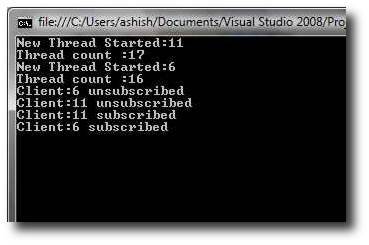 It shows how to use WebSocket to implement "server push" technology using C#. I have written a very simple multithreaded WebSocket server for the example presented in this article. If you are new to WebSocket please visit this site http://en.wikipedia.org/wiki/WebSockets . WebSocket is relatively new technology, with lot of potential. In this article, we will see steps involved in creating a very simple WebSocket based application. The code above is called when the user clicks on "Try to Connect" button. Here we first create a new "WebSocket" object, by passing the URL of the server. The "ws.onopen" function gets invoked when a connection is opened successfully. Sending data to server after that is as simple as calling "send" method as shown in code above. The "ws.onmessage" function is invoked on successful receipt of data. The good part here is that the protocol makes sure that it is possible to return all data sent by server in one go (as opposed to reading from a stream). The "data" property on the parameter to this function contains data sent by the server. The "ws.onclose" close method gets called when either the "server" or "client", terminates the connection. In this function we are changing the UI properties of the buttons. The code above is for two way communication between client and server. There is a common button "Start/Stop" using which user can tell the server to temporarily stop sending updates. To stop/restart listening, client sends the text "STP" and "STR" respectively. So, this is all the code which we need for the client (apart from the HTML). If you have used AJAX , the this code should be strikingly similar. However AJAX and WebSocket are very different technologies, I will discuss that in last section. But the good part with WebSocket is, that there is nothing new to code at the client side. In fact you can very easily port all your AJAX applications to WebSocket. The real difference is at the server side and that is where things start getting a bit complicated. As I have said earlier, the server is the place were things get complicated. This has nothing to do with the WebSocket protocol, but with mindset of web developers(like me) who generally don't have too much exposure to sockets programming. Till now life in web development was made easier by HTTP servers and various frameworks. Since WebSocket is emerging technology there are not many tools available to make life easy. So we have to create our own server and code to handle clients (for now at least). The server which I have written for this article is very basic one. It by no means contains comprehensive implementation of WebSocket protocol. My code is monolithic and might have very limited reuse potential. It is basically a TCP server with some additional code to handle WebSocket protocol. It is multithreaded and capable of handling multiple clients. Since the code is pretty complicated, I will only discuss the important points in this article. Handshaking is the initial exchange of information that happens between server and the client. It basically is a check at each end, to ensure both the parties understands the protocol that is been requested. The server contains an instance of "TCPListener" which listens to incoming TCP request at specified URL and port. I have created a new class called "WebSockClientManager", which is responsible of accepting a new client connection via the listener and managing the connection. Once a connection is established, I create a new instance of "WebSockClient", which is another class written by me ; and add it to the instance of "WebSockClientManager". The idea is, there will be only one instance of "WebSockClientManager" which will manage all clients. Given below is code to initialize a "WebSockClientManager". //Send Sever Handshake to client. For more information on Handshaking in WebSocket please refer to following document:http://tools.ietf.org/html/draft-hixie-thewebsocketprotocol-54 . If after transmission of the above text, the client did not drop the connection, it means that the WebSocket connection was successfully established. Once connection is successfully established, we can start sending or receiving data. The "HandleClient" method does two things: performs handshake and if it is done (and everything is OK) reads/transmits data to client. Inside the "WebSockClientManager.HandleClient" method we listen to data which client is sending. If the client sent "STP" or "STR", we accordingly change the status of the client, so that it is subscribed/unsubscribed from server. // Read data from client. Do whatever is required. Also you may want to change values for "MAXCONNECTIONCOUNT" and "LOGTOMONITOR". The first one specifies the maximum number of parallel connections the server should handle , while the later specifies the name of the Windows event log which the server should be monitoring. In the example I am monitoring the "Application" event log, you may want to change it to a different log if you don't have permissions to this log. In that case you can write a sample windows service/application to write some test entries to your log on some event (just for testing). After going through all this let me tell you how to run the application. 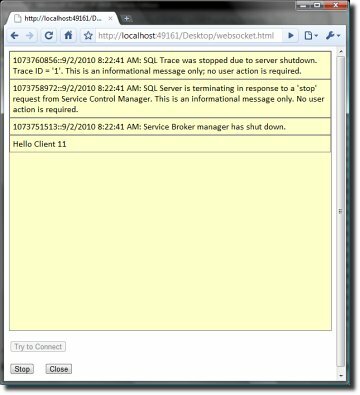 Once the server is up, access your webpage (client) using a web browser which supports WebSocket. DO NOT run the webpage locally, it MUST be hosted on a HTTP server. Once the page has loaded, press the "Try to Connect" button. You will receive "Hello Client" from the server. Now perform some actions that writes to your event log. I generally go to "services" and start/stop Sql Server service to generate events. You can view these events on the clients UI. You can choose to Stop/Start subscribing to the server and it should work. Also try starting multiple client instances. Multiple clients in action and snapshot of the server. In my personal opinion, WebSocket is going to be next big thing in web development. Its going to take time to mature. Once big players start creating development tools and frameworks for writing client and servers, WebSocket is definitely going to take-off. With things like HTML5 and WebSocket, the browser is, in my opinion, going to replace most applications you use. Hope this article was useful to you. Please share your feedback and criticism via comments. Also you may want to take part in the poll which I created on WebSocket, to share your opinion on this technology.